Kyogoku, C., et al. Psychiatry Res (2010) In press. 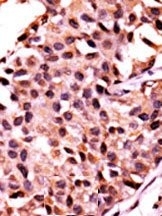 Formalin-fixed and paraffin-embedded human cancer tissue reacted with PPP3CC polyclonal antibody ( Cat # PAB4153 ) , which was peroxidase-conjugated to the secondary antibody, followed by AEC staining.This data demonstrates the use of this antibody for immunohistochemistry; clinical relevance has not been evaluated. Western blot analysis of PPP3CC polyclonal antibody ( Cat # PAB4153 ) in A-375 cell lysate. 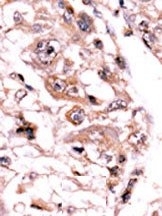 PPP3CC ( arrow ) was detected using the purified polyclonal antibody. 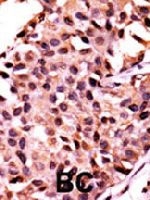 Formalin-fixed and paraffin-embedded human cancer tissue reacted with PPP3CC polyclonal antibody ( Cat # PAB4154 ) , which was peroxidase-conjugated to the secondary antibody, followed by AEC staining.This data demonstrates the use of this antibody for immunohistochemistry; clinical relevance has not been evaluated. Western blot analysis of PPP3CC polyclonal antibody ( Cat # PAB4154 ) in A-375 cell lysate. PPP3CC ( arrow ) was detected using the purified polyclonal antibody. Western blot analysis of anti-PPP3CC Pab in A375cell line lysate.PPP3CC(arrow) was detected using the purified Pab. 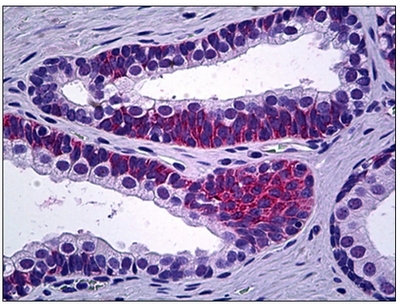 Immunohistochemistry: AP15297PU-N PPP3CC antibody staining of Formalin-Fixed Paraffin-Embedded Human cancer tissue, followed by peroxidase conjugated secondary antibody and AEC staining. Western Blot analysis: AP15297PU-N PPP3CC antibody staining of A375 cell line lysate. Western blot of hPPP3CC-E33 AP31353PU-N in HL-60, Jurkat, A375 cell line lysates (35 ug/lane). PPP3CC (arrow) was detected using the purified Pab. 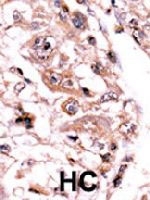 Immunohistochemistry analysis in formalin fixed and paraffin embedded human brain tissue reacted with PPP3CC / CALNA3 Antibody (N-term) Cat.-No AP53421PU-N followed by peroxidase conjugation of the secondary antibody and DAB staining. Western blot analysis of PPP3CC / CALNA3 Antibody (N-term) Cat.-No AP53421PU-N in MDA-MB435 cell line lysates (35ug/lane). 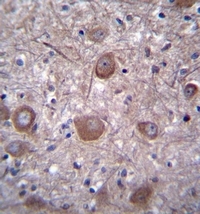 This demonstrates the PPP3CC antibody detected the PPP3CC protein (arrow).